Roni Howard is about to begin her last year at The University of Wisconsin – Oshkosh. 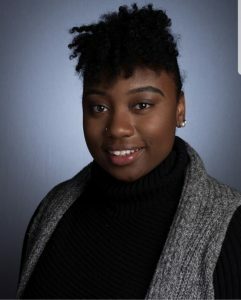 She has been very active on campus in student organizations such as the Black Student Union, the Multicultural and Diversity Coalition, the Social Work and Ignite Christians. Last year she was elected to serve as a senator of the Oshkosh Student Association and this year she will serve as the student body president. Roni is thankful for the financial and emotional support provided by members of the Rotary Club of Milwaukee over the years. Throughout her college journey her mentors, Jackie Herd-Barber and Renee Anderson, were there for her through the victories and the hardships. She felt comfortable calling when she was in a jam. They never gave up on her and she is deeply grateful for their support. She has also had other mentors like Jim Miller and Art Wasserman who provided listening ears when she needed a ride to a Rotary function. After graduation Roni plans to continue her education by pursuing a master’s degree in public administration and urban planning. She plans on working for the State Human Services Department, in in her hometown of Milwaukee. Roni quoted her history teacher saying, “Don’t let the challenges of not hitting the ball take you out the game” and Roni has shown that she can overcome challenges and push through with the help of her mentors, friends, family, and the community.